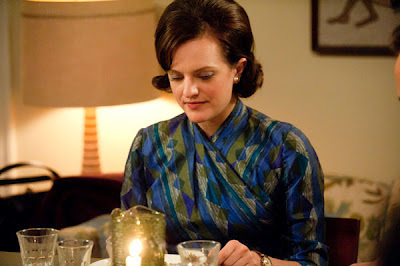 "Mad Men" Review: "At the Codfish Ball" (Season 5 Episode 7) - "Have a drink. Become nice again..."
Elizabeth Moss as Peggy Olsen on "Mad Men"
The long-awaited fifth season of Mad Men continues with episode 7, “At the Codfish Ball,” and as always, I’m here with my weekly review and analysis. To do the hour justice, this review contains heavy spoilers, so don’t read unless you’ve seen the episode. Spoilers for “At the Codfish Ball” after the jump…. I’ve been adamant since the season premiere that this fifth season of Mad Men is all about studying why these flawed, dysfunctional characters act the way they do; each episode has explored possible answers in relation to different subsets of the ensemble, but it’s all tied back into one central theme: insight. When our characters are self-destructive, it usually stems from internal flaws they are incapable of seeing, and the omniscience of the audience has allowed us to realize how much happier these people would be were they capable of meaningful introspection. Last week’s episode was significant for many reasons, not least of which that one of the show’s single most maladjusted character, Roger, finally had a blinding moment of insight that made him serene, clear-headed, and happier than ever before. His relaxed, transcendent attitude continues this week, seemingly adding further evidence to this crucial central theme. But here’s the thing about insight: it isn’t always correct. Megan’s day-saving Heinz pitch is born from a tremendous moment of insight: the realization of repetition between vastly different generations. This insight is unique to Megan’s character; it’s not one the men at the firm could have seen, because their tunnel vision prevents them from meaningfully perceiving the contrasts between generations. It’s not even one Peggy would have thought of, because although she’s riding a massive wave of social change, she’s also living through every moment of it, without the ability to take a step back and gain a three-dimensional comprehension of her life in relation to the world at large. But Megan’s a little bit younger, and she’s an outsider; as her father notes at the end of the hour, she skipped ahead to the end without walking the path to get there, so she has the opportunity to observe this world, rather than live through its constant fluctuations. Her revelation is a profound and personal insight. The problem is that her takeaway from this discovery is misguided. She recognizes that generations bear similarities and differences, but her prioritization of the comparisons shows a fundamental misunderstanding of the world around her. Generations are not defined by the traits they share, and in 1960s America, that fact becomes more important than ever. “At the Codfish Ball” presents us with example after example of how the world is changing, of the communication barrier between the old and the young and the clash between social norms and newfound ideas of personal fulfillment. The platitude that life is static is simpler and more comforting for many of these people – and it’s why Mr. Heinz accepts this pitch where he rejected Peggy’s smarter, intellectually stimulating one – but continued belief in such lies could be the biggest harm these characters could inflict on themselves. The generational gap is dramatized in the opening scene, as Sally’s telephone conversation with Glen – a boy who exemplifies the dark side of sixties youth counterculture – literally creates a great amount of harm for her Grandmother, who trips over the wire and breaks her ankle. Sally then gets to live out her dream scenario: spending the weekend as an adult, joining her father and his in-laws at the dinner table and even attending Don’s fancy award reception. Sally has always been mature beyond her years, and here, she wants desperately to be like all the adults around her, without truly understanding what that means. It’s impossible to fully grasp, after all, because her perception of adulthood is one she’ll never experience. It’s based on the grown-ups in her life, a model that won’t be around when she reaches her father’s age. Sally would be only a few years older than my own mother today, and when I contrast her to the adult women on Mad Men, I know that Sally, simply by virtue of the times she lives in, won’t grow up to live in a world anything like the one of her childhood. Don’s simple fatherly instinct of not wanting his daughter to grow up too fast led him to reject Sally’s make-up, but as signified by the exchange with the waiter – and the bookending phone conversation with Glen – it’s clear that Sally is, for the time being, done with trying to be an adult. She no longer wants to force herself into a fundamentally different generation, because despite what Megan’s ad insists, times do change, and Sally needs to let her adult identity develop naturally as years, time, and certain social customs pass by. Make-up and dressy boots can wait. During the impromptu Heinz pitch, Megan seals the deal by explaining: “A mother and child at dinner – that will never change.” Even while these words are coming out of her mouth, Peggy is having an emotionally taxing day that completely disproves her statement. Abe has something big he needs to tell Peggy, and Joan convinces her that it must be a proposal; progressive as Peggy may be, she’s always been acutely aware and reluctantly interested in the strict sixties image of marriage, so she decides this is what she wants. In a subtle parallel to Sally’s story, she goes shopping, dresses up, and heads to dinner with a certain concept of ‘adulthood’ in mind, only to discover it’s different than what she expected. The difference is that Abe’s actual request – that they move in together, rather than become legally bound – is what Peggy really needs at this point in her life, no matter what she may have tricked herself into wanting. Elizabeth Moss plays Peggy’s reaction beautifully, the quiet realization that this feels more natural crossing her face even as disappointment sets in behind her eyes. But after another talk with Joan – who is in the perfect place in her life to warn younger women against marriage – Peggy accepts that Abe’s offer is healthier than whatever she had dreamt up. This is, of course, the slower and more thoughtful relationship model that will become preferred as time passes by; it allows men and women to find true companionship, rather that economic, social, or political expediency, and more importantly, it grants women greater freedom to be ambitious and successful. In 1966, of course, it’s a large deviation from the norm for a woman of Peggy’s status, and her mother is expectedly disturbed. It’s a fundamental disruption of her comfortable, easily digestible worldview, so she chooses to ignore her daughter, rather than confront such change head on. But no matter what Mama Olsen, Megan, Don, Mr. Heinz, or anyone else insists, the mother and child at dinner image is changing, and faster than they all care to realize. Whether or not they fully comprehend what has happened to them, these experiences give Peggy and Sally profound moments of insight; the crucial part of these discoveries, however, lie in the conclusions they take away, and I’d argue both wind up with healthier understandings of their revelations than Megan does. I must be careful not to read too much into this, as Megan’s pitch is primarily a good business tactic, but it reflects on Megan’s own outlook on the world. Though their interactions were perfectly healthy tonight, we know full well by now that Megan is experiencing a generational chasm with Don. It’s something they could of course work through, but when she can’t quite grasp the evidence of what happens to unsound couples that lies right in front of her eyes – the unhappy, unfaithful, bickering Mr. and Mrs. Calvet – one has to worry about the stability of Megan’s future. 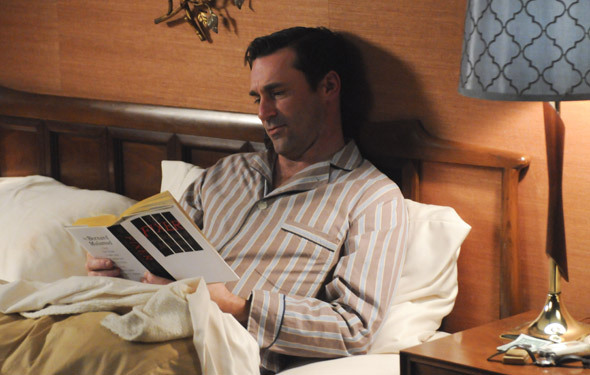 Don reading "Fixer" on "Mad Men"
Don, meanwhile, is the episode’s only central character who doesn’t experience a moment of insight. But in a bit of a pleasant surprise, he’s obviously trying. Don is seen reading two books over the course of the hour: one is Bernard Malamud’s 1966 novel “Fixer,” about a falsely accused Jewish man who spends months in jail contemplating the world and himself, and the other is an instructional French tome. Both indicate Don’s desire to learn or improve, either through introspection or growing closer to his wife via language. As Don reads “Fixer,” though, Megan says her father “won’t care if he finds out you read James Bond,” hinting at another of Don’s literary pastimes. James Bond, of course, is often depicted as a man incapable of personal insight, a spy who saves the world while acting suavely self-destructive. Don is routinely compared to 007 for good reason. Yet in this episode, he left Fleming on the shelf, and chose books of guidance and education instead. He’s reaching for insight, just as he has been all season, but when the time finally comes, will his conclusions be correct? Can they ever be when one is human, incapable of omniscient thought? That central philosophical quandary will, I believe, be the defining question these characters must answer before the season is out. This year has been more character and subtext focused than others, which is exactly why I adore it so much, and though four-and-a-half seasons of Mad Men has prepared me for extensive heartbreak, I hope these characters’ insight ultimately leads them to better places. Peggy, Sally, and Roger seem, for the time being anyway, to be on the right side of that line, but for everyone else? Only time will tell. A very thoughtful and interesting review. I enjoyed it.